Indigo Girls are no stranger to live albums and Staring Down The Brilliant Dream continues in their tradition of successfully capturing the magic and energy of their shows. Instead of just picking one city on the tour, rolling tape and releasing it as an album, they've compiled 31 songs from a variety of concert stops and created a great experience for their fans. While some bands are struggling to release albums with 9 or 10 songs on them, Staring Down The Brilliant Dream is a double album with the first disc clocking in right under an hour and the second disc going over an hour. In addition to the incredible music, the liner notes include personal thoughts on every song from Emily Saliers and Amy Ray regarding the song’s inspiration, concert memories and why they chose the specific performance they did. 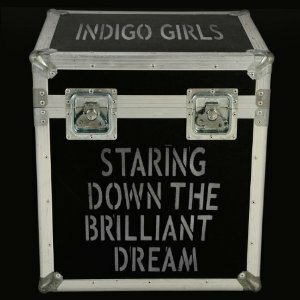 Capturing all aspects of their quieter duo moments and their full band jams, Staring Down The Brilliant Dream shows the full spectrum of what an Indigo Girls concert offers. On hushed songs like “Moment Of Forgiveness” and “Salty South,” Amy and Emily’s voices and guitars blend together in a way that leaves no question why they’ve been at the top of the game for 25 years. It’s also really nice to hear the crowd get involved in the sing-a-longs on “Closer To Fine” and “Watershed.” In case anyone may think Indigo Girls are all coffee shops and journal entries, they have no problem cranking the electrics for “Shame On You” and “Go.” Just like with “All Along The Watchtower” from Back On The Bus, Ya’ll and “Midnight Train To Georgia,” “Tangled Up In Blue,” “Down By The River” and “River” from 1200 Curfews; Indigo Girls pull out some killer covers for this live album by turning in heartfelt renditions of Bob Dylan’s “Don’t Think Twice It's Alright” and The Rolling Stones’ “Wild Horses.” With such a talent for songwriting and singing some of the best harmonies around, Indigo Girls cemented their place in musical history a long time ago. I must admit though, I still really enjoy it every time they release another beautiful album to remind us why. 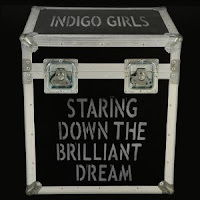 Staring Down The Brilliant Dream will be available June 29th.